From the highs of a blue day enabling a long-awaited 500km – at record speed – to the lows of experiencing a very final glide, you can share the emotions in the April/May issue of S&G. There are also more top tips on soaring ridges and mountains and the glider pilot’s perspective on flying the Silent 2 Electro. It was a task that John Williams had been waiting an eternity to try, and conditions on 9 February allowed him to finally complete a pre-prepared triangle. Not only that, but John completed the task he describes as neither easy nor boring at a speed that should secure him a UK record. Afandi Darlington had been enjoying his first visit to Italian mountain site Rieti, flying his ASG 29E in the 18m Class of the 2013 Coppa Internazionale del Mediterraneo gliding competition. On the final day of the comp, a thunderstorm put paid to his hopes of consolidating second place and instead he found himself facing a crash.Afandi considers himself extremely lucky to have walked away without even a scratch and shares his story in the hope that others can learn from an experience he does not recommend. If you are eager to enhance your ridge and mountain soaring skills, don’t miss the second part in our Ask the Coach feature, Learn to soar ridges and mountains. Tony Cronshaw has more top tips from leading coach Bernard Eckey and French mountain instructor Rémy Desbenoit. Glider pilot Allan Arthurs was delighted to become UK distributor for Alisport’s Silent 2 Electro. He invited a number of fellow glider pilots to experience flying this SSDR microlight sailplane and share their views on what might be ‘tomorrow’s world’. Those of you attending the recent BGA conference will have seen the Silent 2 Electro taking pride of place in the hotel foyer. Also in this issue: Shaun Lapworth takes us through the steps required following a mandatory FLARM update. Catharine and Paul Jessop debate what Homer might think of the pre-flight checklist. In another tale from Down Under, ex-London GC member Mark Dalton reflects on his experience of the ground effect. Frank Jeynes brings home his new toy, an Arcus T. BGA Medical Adviser Dr Peter Saundby looks at modified BGA medical requirements, which mean less bureaucracy and cost for glider pilots. Adrian Emck explores the potential toencourage women (and men) to become, and stay, glider pilots. Saz Reed reports on the juniors’ flour bombingmission at Denbigh. We’ve a report on the BGA conference and AGM. Pete Stratten highlights the benefits of athree-year extension to fix EASA training and licensing requirement. 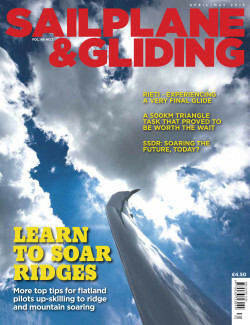 Bruce Stephenson looks at the case forOlympic approval for gliding. Martin Langford explains how safety management is working at Talgarth, without it being more difficult or any less fun to fly. Plus there are many more of your stunning images in the Gallery pages. Rieti - a sting in the tail.